Smear in the back of user’s throat and on back of tongue. Allows users to go without breathing for extended periods of time. Blocks swallow reflex to avoid swallowing the jelly while in use. After removing the jelly, an extreme bout of hiccups kicks in, lasting about 45 minutes. A slight rash over the throat. It usually lasts about a day, but repeated use within a short time may make it last longer. 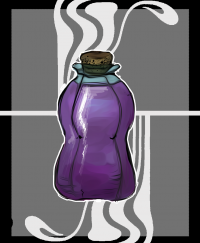 The Wodnik’s Jelly is used by fishermen all over Aloria, with the exception of Maiar. It allows the user to go without breathing for extended periods of time, safeguarding the user from drowning. The jelly is rather difficult to obtain, but it can often be found at a market, or novelty store. A byproduct of the concoction, commonly referred to as “Slag,” can be used as a psychedelic drug. Slag is just the impurities solidified into a mineral form. The Wodnik’s Jelly was created in 238 AC by Wilhem Banasik, an Ailor alchemist who lived in a small fishing village. It was developed during a particularly bad season, allowing fishermen to swim deeper to fill their nets. It took a little over a year to reach the final product, though it still came up lackluster. Then, he had an idea. Instead of trying to make breathing underwater possible, he would take a page out of the vampires’ book, and make the body use less oxygen. It was a success, and merchants quickly took the opportunity to sell their customers something “new and exciting, from foreign lands!”. About thirty years later, a Chi’en-ji improperly disposed of the slag, burning it, and producing the smoke that quickly become a favorite among deviants and thrillseekers. Wodnik's Jelly makes use of some very odd and exotic ingredients. First, the Barnacle Trout eggs and the dried Corpse Weed need to be ground up together into a paste. The paste should then be scrapped into a bowl where the Vocadine is gradually added making the substance wetter. Once all of the Vocadine has been added, the Maiar blood and the Sea Swoof poison should also be combined together. This mixture of exotic animal parts should then be added into the bowl mixture and stirred well before being kept at a steady heat for one hour. Once that is done, it should be rapidly cooled and left to sit for at least three days. By that time, it will have become gelatinous and can be consumed at any time. Smear about 3 spoonfuls of the jelly on the back of the user’s throat and tongue. Within a few seconds of application, the effects kick in. It allows the user to go without breathing for an extended amount of time, usually around ten minutes before needing to resurface, as the jelly slows the body’s need to breathe. It also blocks the swallow reflex so the user doesn’t swallow the jelly by accident, which would result in near-certain drowning, as the effects would disappear as well. The jelly has only two side-effects: Hiccups, and a slight rash over the throat. Both these side effects occur once the jelly has been removed. The jelly is good for about four hours after application, before the diver must resurface and take another breath before going under again. Wodnik’s Jelly has the texture of your average jelly, albeit a slightly damp feeling. It smells fairly musty, with a hint of freshly-made apple cider. As for taste, it’s sickeningly sweet, like burnt caramel. The jelly looks like normal grape jelly, but a lighter shade of purple. There are two ways to use slag. Grind it up and smoke it with a pipe, or grind it up and stir it into a drink. Slag has the appearance of a small, translucent black stone. When used, the user has psychedelic visions of their own distorted world, and some bizarre dreamworld. Unusual combinations of color can occur, such as pastels and neons mixed with shades of black and grey. It isn’t unusual for Wodnik’s Jelly contests to be held. The contestants are given the jelly, and a set amount of time. The person who catches the most fish underwater wins. This page was last edited on 12 December 2018, at 10:47.